Oxide ceramics are sensitive to slow crack growth because adsorption of water can take place at the crack tip, leading to a strong decrease of the surface energy in humid (or air) conditions. This is a major drawback concerning demanding, long-term applications such as orthopaedic implants. 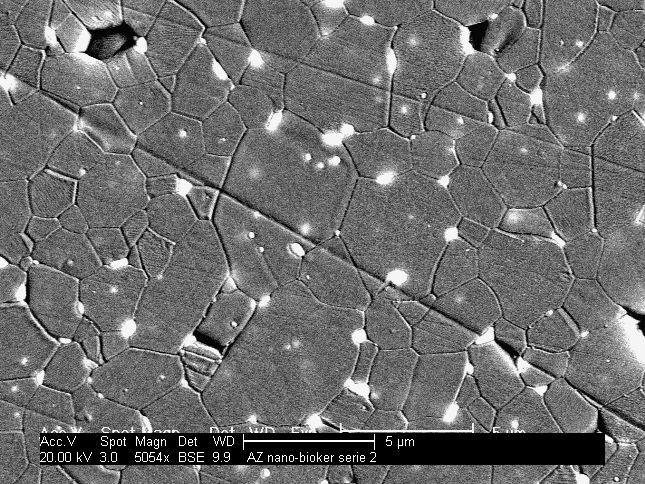 We showed that a specific nanostructuration of ceramic oxides can lead to a crack resistance never reached before, similar to that of covalent ceramics. We also performed a complete reliability assessment ensures a potential future development for these kinds of new nanocomposites in the orthopedic field. Chevalier J, Taddei P, Gremillard L, Deville S, Fantozzi G, Bartolomé JF, Pecharroman C, Moya JS, Diaz LA, Torrecillas R. Reliability assessment in advanced nanocomposite materials for orthopaedic applications. Journal of the Mechanical Behavior of Biomedical Materials 2010:1-12. Chevalier J, Deville S, Fantozzi G, Bartolomé JF, Pecharromán C, Moya JS, Diaz LA, Torrecillas R. Nanostructured ceramic oxides with a slow crack growth resistance close to covalent materials. Nano Letters 2005;5:1297-301.